July 31 update: The Sarah Palin movie The Undefeated plummeted once again at the North American box office this weekend (July 29-31), according to studio estimates found at Box Office Mojo. After losing 10 of its 14 theaters, The Undefeated collected a meager $5,200 over the weekend – down a horrific 79 percent – and a dismal $1,300 per venue. Last weekend, The Undefeated was down 62 percent despite a 40 percent increase in the number of theaters showing the film. Sarah Palin fans shouldn't despair. Next February, both the former U.S. vice presidential candidate and The Undefeated movie should be up for Razzie Awards – handed out to the very worst cinematic mis-accomplishments of the year. Starring Mamma Mia! and Captain America: The First Avenger actor Dominic Cooper, and 8 Women and Swimming Pool actress Ludivine Sagnier, Lee Tamahori's The Devil's Double opened with $95,000 at 5 locations, averaging an acceptable $19,000 per site. The Devil's Double is a fictionalized account of Latif Yahia, a man forced to impersonate Saddam Hussein's son Uday Hussein. 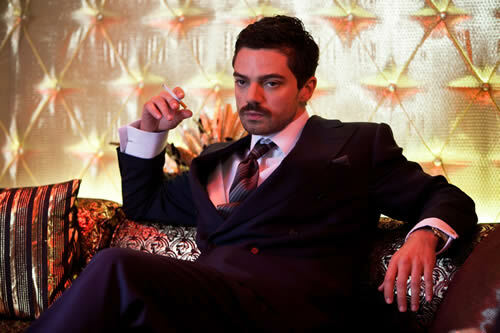 An Arabic-accented Dominic Cooper plays both Uday H. and Yahia. Directed by Joe Cornish and co-executive-produced by Edgar Wright, the comedic alien invasion movie Attack the Block opened with $130,000 at eight locations, averaging $16,850 per site. Much like the opening figures for The Devil's Double, those are acceptable – though not more than acceptable – opening numbers for a movie in very limited release. Remember: all things being equal, the fewer the number of theaters, the higher the per-theater average. In the Attack the Block cast: Nick Frost, Luke Treadaway, and Jodie Whittaker. Last weekend, Elle s'appelait Sarah / Sarah's Key opened at five sites, averaging $23,142 per theater. This weekend, The Weinstein Company expanded its release to 33 sites. The buzz must have been good, as Sarah's Key was up 218 percent, collecting a solid $369,000 and averaging $11,182 per site. In other words, there's still room for further expansions. Photo: The Devil's Double (Herrick Entertainment / Sofie Van Mieghem). July 24: Blame it on a liberal/left-wing conspiracy, Obama's repressive policies, or Captain America: The First Avenger, but despite the addition of four theaters – or a 40 percent increase in venues – the Sarah Palin movie The Undefeated plummeted 63 percent on its second weekend out. At 14 locations, The Undefeated collected a dismal $24,000, for a per-theater average of $1,714, according to studio estimates found at Box Office Mojo. Expect Sarah Palin and The Undefeated to disappear from North American screens very shortly. That is, until both Palin and the Stephen K. Bannon-directed documentary inevitably resurface early next year at the Razzie Awards. Performing much better in limited release was The Weinstein Company-distributed Sarah's Key, directed by Gilles Paquet-Brenner, and featuring Kristin Scott Thomas and Mélusine Mayance. The Holocaust-related drama collected $117,000 at five theaters, averaging $23,400 per site. Additionally, Sarah's Key has already taken in $13.42 million overseas, chiefly in France ($6.41m) and The Netherlands ($4.37m). Also performing well, Mike Cahill's sci-fi drama Another Earth earned an estimated $78,400 at four theaters. Its per-theater average was $19,600. Another Earth features Brit Marling, Matthew-Lee Erlbach, and William Mapother. Faring more modestly, IFC's The Myth of the American Sleepover opened in one New York City theater, where it grossed $9,100. Directed by David Robert Mitchell, The Myth of the American Sleepover features Claire Sloma, Marlon Morton, and Amanda Bauer. Despite reports to the contrary, the Sarah Palin movie The Undefeated did not play to empty houses on its first weekend out in North America. According to Box Office Mojo, The Undefeated brought in $65,132 at 10 locations over the weekend of July 15–17, '11; the Stephen K. Bannon-directed film's per-theater average was a so-so $6,513. So, “so-so” may not mean “packed houses” or “boffo” (in icky Variety slang), but non-existent patrons bring in no revenue. The claim that The Undefeated was playing to empty houses became “fact” following a report by The Atlantic's Conor Friedersdorf, who described his experience sitting mostly alone at a midnight screening of the Sarah Palin documentary in – mostly Republican – Orange County, right behind the Orange Curtain southeast of Los Angeles. But clearly, paying customers were around at other The Undefeated screenings in Orange County, Houston, Phoenix, Indianapolis, and elsewhere. Perhaps far-right Republicans go to bed early? For comparison's sake: on opening weekend, Charles Ferguson's Inside Job averaged $19,825 at two theaters, Alex Gibney's Client 9: The Rise and Fall of Eliot Spitzer averaged $5,654 at three theaters, and Judith Ehrlich and Rick Goldsmith's The Most Dangerous Man in America: Daniel Ellsberg and the Pentagon Papers earned $1,114 at one location. Inside Job cumed at $7.87 million worldwide; Client 9 grossed a total of $192k and The Most Dangerous Man in America $453,000. Another 2011 release aimed at the American far-right, the widely derided Atlas Shrugged: Part I, bombed last April. Produced for $20m, the film adaptation of Ayn Rand's Atlas Shrugged collected a mere $4.62 million in North America after much fanfare about a middling opening – $1.68 million at 299 locations, or $5,640 per venue. Now, some heartless bleeding-heart Liberals have ridiculed the title of Palin's movie even though it may actually turn out to be prophetic. After all, The Undefeated will almost certainly be up for at least one major honor during movie awards season: With a 0 percent approval rating on Rotten Tomatoes – 11 critics; 11 pans – The Undefeated is already a Razzie 2012 front-runner. I guess the only Sarah Palin news in the next week or so will be whether or not she will attend the Razzies for her award. Hopefully, they will give her the wrong address. They need to change the title (even the movie has been defeated), or pull it and act like it never happened. What an embarrassment. This is funny. There aren't enough Palinian parrots and pigeons to make this even appear to be of interest - they obviously aren't seeing it multiple times. Bannon has gone silent while most people have lost interest. Interesting that Palin's supposed to “announce” in Aug or Sept before the DVD hits Walmart on October 1st. Soon this movie will be another forgotten attempt at keeping Palin in the news (I guess the bus tour is over - there was only supposed to be a break while Sarah attended jury duty). Sarah overplayed her hand. When she can no longer convince her dwindling base to shell out 8 bucks to see their queen immortalized on the bug screen, she is in trouble. Bannon thought he'd made a 'family movie' about a great, misunderstood woman. Instead, he filmed a load of garbage that no one BUT her base is even interested in. Where are the facts about MatMaid, Troopergate, the ethics investigations she LOST, babygate, and so many others? Where is the scene where she told Frank Bailey and staff to drum up those popularity numbers by rigging the polls? Not to mention writing her own letters to editors and getting others to sign and deliver them. The woman is a gutless wonder…rich as Satan, and with as much conscience. Besides the fact that you're comparing apples and bananas — wide release, younger target audience vs limited release, older target audience — I don't know where you got your box-office figures. HARRY POTTER AND THE DEATHLY HALLOWS: PART 2 was down 72% on its second weekend out. However, considering that first-weekend box-office figures included $43.5 million from Thursday midnight screenings, DEATHLY HALLOWS 2's actual drop-off rate was 61%. On its third weekend, DEATHLY HALLOWS 2 was down 53%. Sarah Palin's THE UNDEFEATED drop-off rates: 62% on the second weekend (despite a 40% rise in the number of theaters showing the film) and 79% on its third weekend. Any way you look at it, THE UNDEFEATED bombed at the North American box office. Give me a break, Palin's movie Is Down exactly the same percentages as Potter the last 2 weeks. All I can say is there is no Mitt movie, and Obama won't get a Razzie, he will get voted out. Oh for God's sake, who are you kidding? Get your facts straight. Michael Moore's films last much longer than one weekend at the box office. When it opened at 4 theaters, Capitalism: A Love Story grossed $231,964. In the end, it grossed a total of more than $14 million. And that was Moore's least successful documentary of the decade. The Sarah Palin documentary The Undefeated opened with $65,000 at 10 theaters. It has grossed only $101,000 after ten days and it'll be lucky if it reaches $200,000 before it disappears from view. Don't expect millions (or even tens of thousands) in DVD sales either. It is wonderful news for Sarah Palin fans and supporters that the powerful documentary about her amazing, inspiring life and career, “The Undefeated”, will become available in a variety of venues and formats. Sorry, never heard of Kristin Scott Thomas. Oh for God Sake, it was a political documentary which stirred up discussion about a candidate yet to announce. Michael Moore films last about as long. Liberals were obviously terrified enough of Palin to compare hers to Harry Potter. It'll be seen. It'll be on cable networks, pay-per-view, Netflix, etc. Lots of time between now and next year. But hey if liberals believe this means Obama will win re-election, then hey, quit sending him your money, register as Republicans, and vote for Palin in the primaries so that she's his opponent! In fact, I welcome it! Sarah Palin is done. Her movie is a bust. She can't even convince her many donors to sit through the two hour lovefest. She didn't get on the ballot in Iowa because she refuses to play by any rules. Instead of expressing horror at the events in Norway (which are directly tied to her own dominionist ideals) she uses FACEBOOK to criticize the President (oh, that's new, Sarah!) She's a moron, period, and no matter how much SeaofPee loves her, she is not running for President of anything. Hmmm - defeated in 2008 with McCain, defeated by whatever made her unable to finish her job as governor (Iamestream media?, libtards?, anyone or anything besides Sarah herself? ), and now the misnamed movie is defeated (fans can't/won't skew numbers by seeing it multiple times, and even if SarahPAC buys blocks of tickets to give away with paltry donations, they still won't fill seats - this is not like a book). Running out of steam, going down in flames, unable to sustain attention with the “will I or won't I” carrot-on-a-stick…. three time loser any way you look at it. She's got a LOUD but relatively small number of diehard fans, and whatever Sarah Palin does will only result in more overexposure. Not one Liberal has actually reviewed the movie which is a good thing. Would you call the paramedics?